Bollywood has been a growing craze and a popular theme for parties. Bollywood is the nickname for the Indian Film Industry and the dynamic dance styles featured throughout. Often a blend of Classical Indian dance and a wide array of dance styles including folk dances, hip hop, latin, contemporary, belly dance and more. With it’s high energy, gorgeous colourful costumes, catchy music and stunning jewelry it’s no wonder this style has caught on internationally, often featured in movies, music videos, dance competitions and more. A Bollywood bachelorette party will include a dancer(s) performing a 5 minute medley of Bollywood hit songs to kick off the event followed by a 45 minute workshop teaching everyone a fun and easy Bollywood dance to a cheeky hit song which everyone will be able to perform together. This is then ended off with one more performance by the dancer(s). Jewelled Bindhi’s for all the ladies at a price of R10 per lady. 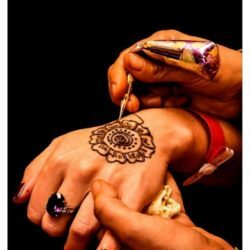 A Fantastic party extra – Book our Henna Tattoo artist to decorate your guests!